October 2017 KoolWheelz Release Party! View Poll Results: Please vote for up to 2 models (ONLY!) you wish to see released first. Okay, its time for the October KoolWheelz releases!! I've got 9 new models ready to go...probably have more before the end of the month...but we'll start with these. Not sure how fast I'll release them...at least one a week...maybe two. ...and post the build before I will release the next one. you can vote* on what order you want them released...whichever looks interesting to you. 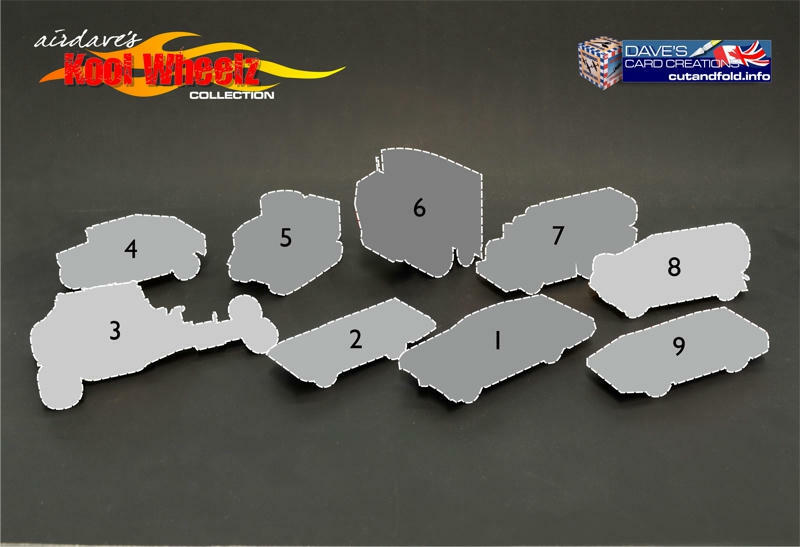 but all you get is this vague outline of each model. *Voting will take place via Poll above. Vote for the model(s) you want released first. But, if you happen to know what the model is, I ask that you keep that to yourself until its released. Poll will close sometime on Sunday October 8. The models really vary in skill level...a couple of these are quite difficult. One is very easy (I think). Some are my personal interests and projects...some are from your suggestions and ideas. As usual, I ask that you consider making a donation to help support my work. Paypal....Donations - click the paypal link on my website. Tee Shirts - buy a paper modeling Tee. Link at my website. ...as much fun as I have designing them. Those who are voting...I have a question. can you tell me why you voted for the ones you did? Is it because you recognize the model and it interests you? Or, are you just curious about the model (but you don't know what it is)? I am curious if some of you have actually identified one or more of the models. Combination of both. I am reasonably certain of 2-5. The nose on 1 is somewhat of a giveaway (if I am guessing correctly). Very intrigued by the remainder. Last edited by rickstef; 10-03-2017 at 06:27 PM. Pretty sure about 1, 3, 4, 5, 6. But this would not be the first time I've been pretty sure about something and had to find a tender crow. Well now??? To be honest, only #4 is hinting to me as summat I wouldn't want anyway, but I ain't got a clue about the rest of 'em ... so as yet I ain't voted. I voted for 3 and 5 because well, dragster and maybe a Stuart Tank. I am pretty sure I recognized one of the choices I voted for, and I think I recognized the other one, but not being completely sure. Number 3 I'm certain was a Hot wheels Car that I still have in my collection, 4 and 5 look military. 7 and 8 I see cylinders and 6 might be used with ice. I hope I'm close on these.